Students, faculty and friends and family of the performers filled Morgan Auditorium for their last concert of the year, titled “125 Years of Barbershop” Sunday. “How appropriate to talk about the 125 years of barbershop since it is the University’s 125th anniversary and our founder’s day was just a few days ago,” barbershop coordinator Carol Stephenson said. Stephenson gave some background on barbershop quartets and the importance and prevalence of them in La Verne. This was brought over to the college as the idea of barbershop singing expanded and was adopted by quartet groups. She said she spoke with some people living at Hillcrest Retirement Community in La Verne who had participated in barbershop quartets at the University years ago and that we are lucky to have resident quartets at ULV today. “Barbershop quartets were reintroduced here about four years ago,” Stephenson said. RADD, the first quartet to perform is the newest addition to the barbershop ensembles on campus. The group’s title is an acronym and a play on the members’ first names: Ryan, Aaron, Dakota and Domenick. After their set, Reanna Hilario, president of the barbershop club and senior broadcast radio major stepped to the emcee microphone to introduce the men’s and women’s chorus, the ULVABC Mixed Chorus. “Barbershop quartets became popular in the 1950s and 1960s,” Hilario said. Which is why barbershop groups’ outfits usually resemble the style of that era. The curtains drew back to reveal the Mixed Chorus donned in traditional barbershop hats – tan, short straw hats with a black and red band around the base of the top. Their all black outfits donned a pin replicated as a red and white barber’s pole, which read ‘ULVABC’ on top and each singer’s name on the base. Towards the end, the concert turned into an honoring of those lost this year who were important to the Barbershop Club and its members. 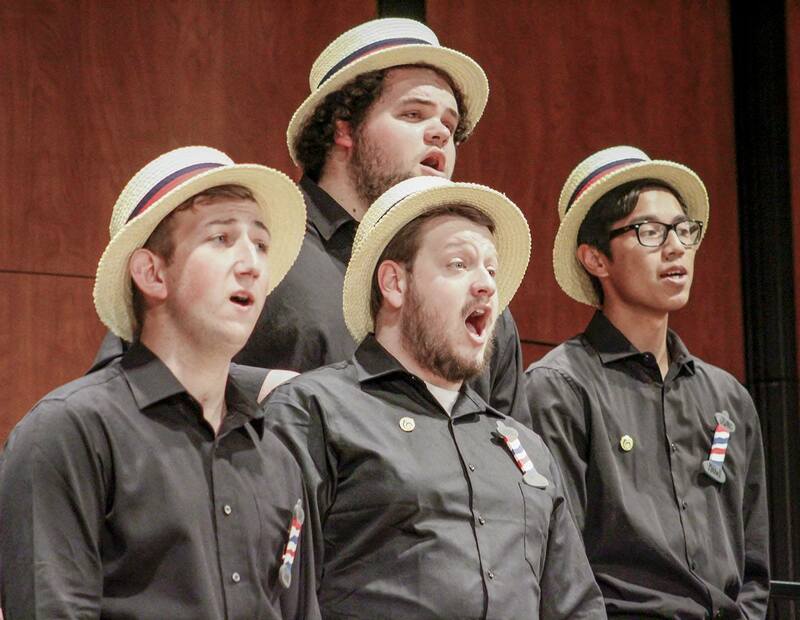 The Lordsburg Brothers, the last quartet to perform, is the longest running barbershop quartet at La Verne. Tenor Ernie Reyes dedicated the second song of their set to his grandfather who recently died, as well as Steve Biondo, former music department manager, who was the heart of music endeavors at the University and died a couple of weeks ago. “First Day in Heaven is not a sad song,” Reyes said. The group sang of the happiness and wonder of getting to heaven that is usually not expressed in songs related to death. Her singers comforted her with hugs and presented her with a bouquet.